According to the manufacturer there are certain home cartridge systems that will require this adapter in order to function properly. You are welcome to buy this adapter at the time you purchase your Super MVS Converter II or you can always order it later if your system experiences compatibility issues without this adapter. Most AES systems will not require this adapter. The Super MVS Converter II was tested with several versions of Japanese and English AES systems and it worked perfectly fine without this adapter. However, the PAL & Korean version AES systems have not yet been tested with the Super MVS Converter II and may require this adapter. Power grid compatibility is comprehensive. See pics 2-3, input is 100 to 240V. 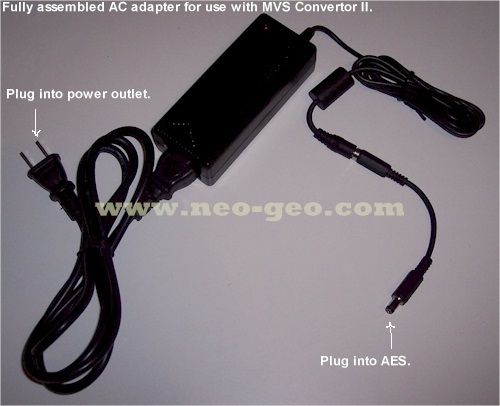 Please review this thread on the Neo-Geo.com forums for further information on if you will require this adapter or not. For technical support, visit our forum dedicated to MVS converters.